The other day I showed you how to use an appliqué template to prepare shapes and fuse them onto fabric. 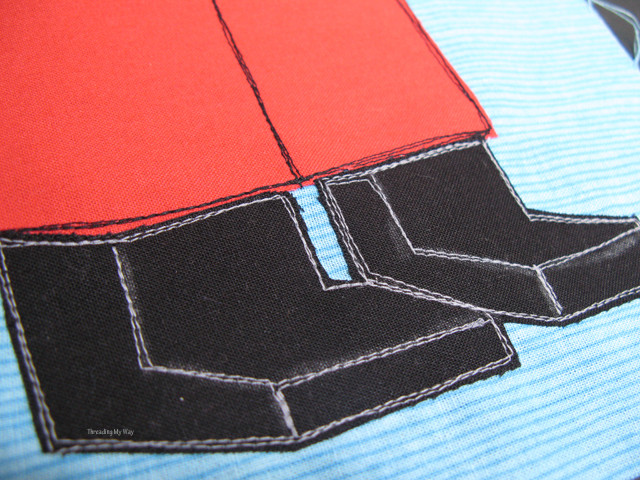 Today I'll show you the method I often use to stitch raw edge appliqué. I call it scribbly stitching, but I've also seen it referred to as wonky stitching or sketchy stitching. The double sided fusible webbing glues the fabric together, but it's not strong enough to stay in position over time. 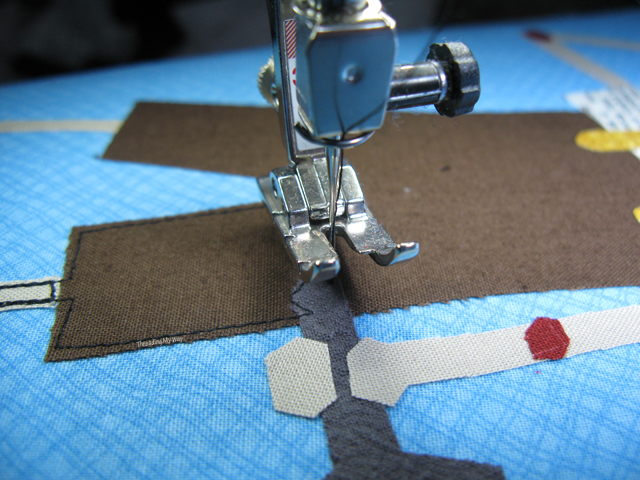 Small pieces will fall off very easily if not stitched. Larger pieces will stay on longer, but possibly not after a few washes. 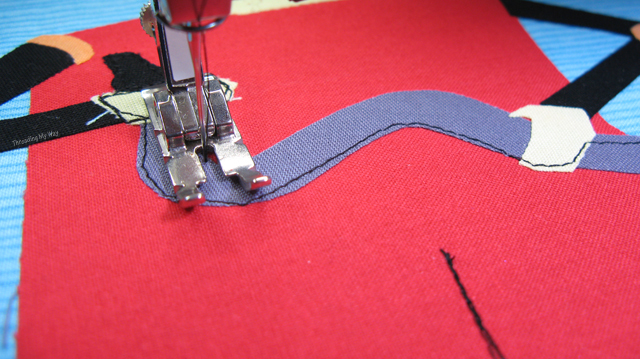 When I first began appliquéing, I always used a zig zag stitch as the final step in the process. Whilst I still like and use a zig zag stitch, for appliqué work where the pieces are irregular or small, I prefer scribbly stitching. I use a zig zag around regular shapes, or where I don't want any fraying at all. Little bits of frayed fabric are part of the charm with scribbly stitching. 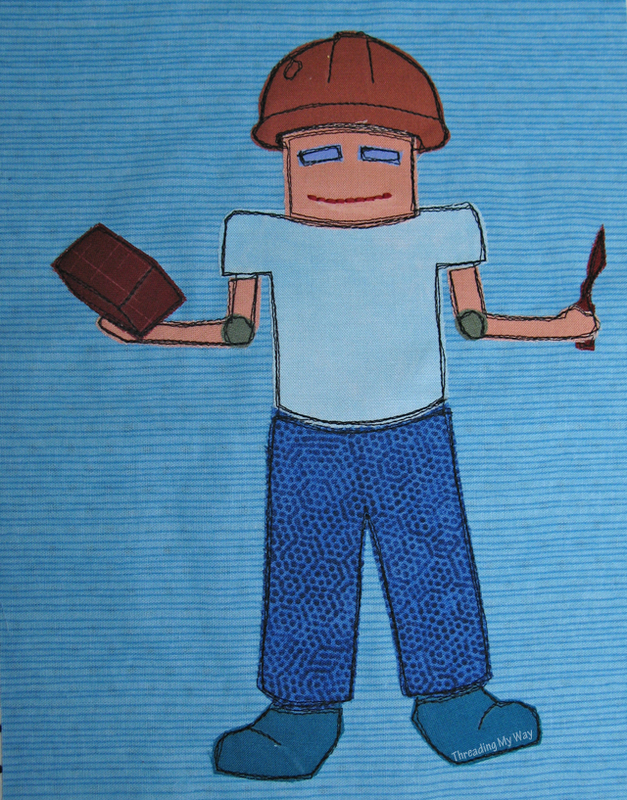 Scribbly stitching is often done as a free motion stitch. Maybe if I were better at free motion, I'd do it that way. At the moment, however, no free motion embroidery for me when doing scribbly stitching. I just don't have the control. 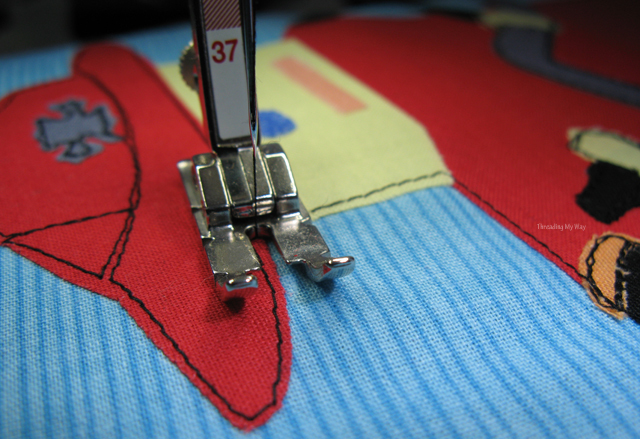 An open toe presser foot will allow you to more readily see the stitching as you sew. I just grabbed the first foot with a gap; Bernina #37. It's actually a patchwork foot, but it did the job. You can see the open part is only narrow and it's just for straight stitching; not zig zag. A better one would have been #20, an open embroidery foot, with a much wider gap. It didn't matter, though. I often just use the regular presser foot and it works fine. Decreasing the stitch length gives greater accuracy. I changed continually throughout the project. For the small circular parts, I went down to 1.5. There's no rule as to how many times you sew around each shape. In fact, there's no rules at all with scribbly stitching. I tend to sew the first line in a fairly straight manner. On the second and third pass, I deliberately make the lines more wonky. An up / down needle feature will help if you have one. In the photo above, it's the button on the left (our left) with a picture of a needle. For very small pieces, especially round shapes, pressing the up / down button lets you easily move one stitch at a time, slightly turning the fabric with each stitch. If you don't have this feature on your machine, don't let it stop you trying scribbly stitching. Just go slowly. And remember, wonky is the effect you are going for. Raise and lower the presser foot as you change directions. You'll be doing this a lot. Use it for circular shapes as well as right angles. In the photo above, you can see what I mean by wonky. If I had only done one row of stitching, I feel that jaggy bit would have been too wonky. By the time another two rows of stitching hde passed over that wonky bit, it no longer looked wonky. 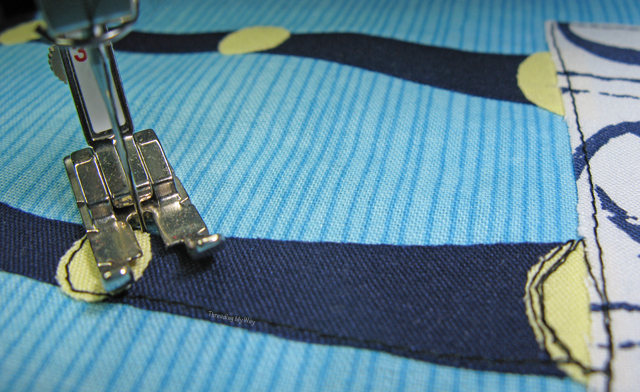 Most shapes end up with three lines of stitching around them, but it varies. I try and do the whole appliqué in one go if I can. I pick a point to begin and just start sewing. 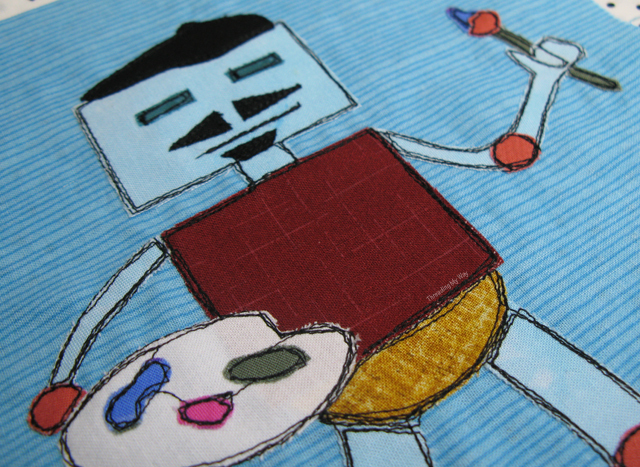 On the artist robot, I began with his body and then stitched down the legs, doing the yellow part in it's entirety first. The shapes sort of dictate the order in which to sew, but it doesn't matter. Doing the whole thing in one go means some parts will have more stitching than others. Again, it doesn't matter. Some parts also look better with more stitching. For the eyes and mouth I did start and stop, although it probably wouldn't have mattered with the navy fabric. On the artist's palette, I kept going. Again, on his face, I chose to start and stop. I usually use black thread, but you can use any colour you wish. It's meant to be seen for both the effect it creates, but also as way of drawing or filling in details. Obviously, black on black doesn't show, so I changed to grey for the fireman's boots. Ignore the white marks on some of the blocks. They'll wash off easily. I read recently, on the Melly Sews Facebook page, that small slivers of soap are great for marking fabric. I'd never heard of this before, but have since found out a lot of people use soap to mark fabrics. The soap worked well!!! I really enjoy doing the scribbly stitching, even though it's quite time consuming. There's just something about it that I find very satisfying. All up, I've made nine robots. Next step is to enlarge the nine blocks, then turn them into a single bed quilt. At 8" x 11", they're too small as they are now. I'm hoping to use a jelly roll and sew wonky log cabin style strips around the blocks. 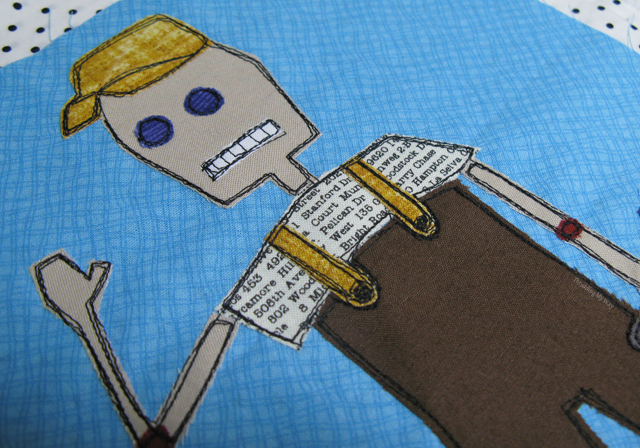 If you would like to sew your own robots, stay tuned. 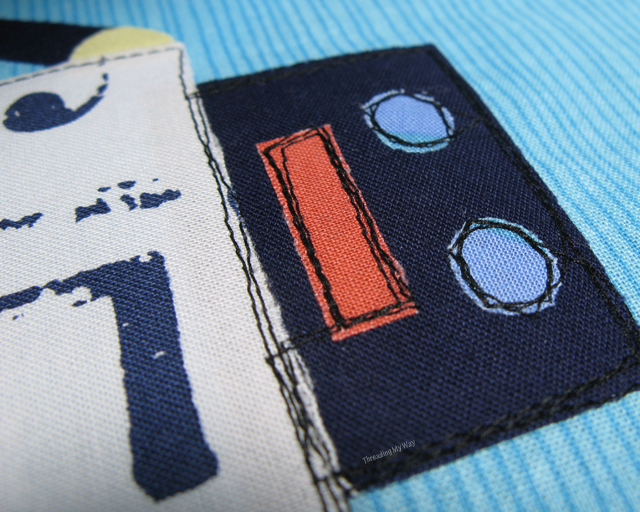 Next week I'll make the nine robot appliqué templates available for FREE download. Have you ever tried appliqué? What stitching method do you like to use? Yes, I really enjoy doing iron-on applique using Steam-a-Seam Lite so I can use a narrow zigzag satin stitch around the edges or use a scribble stitch. 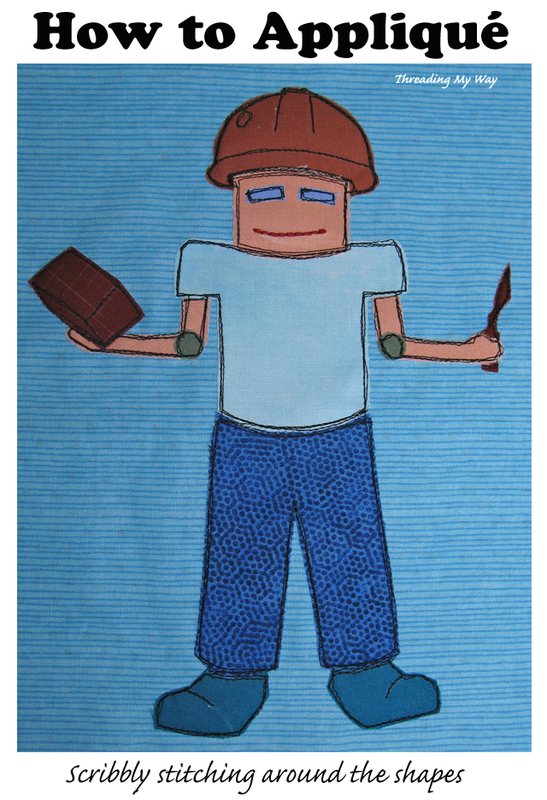 What a fun way to applique! Thanks for the tutorial! I love the way this looks! I hope to try more of it in the future, too. I love raw edge applique, and find free motion the way to go. I am sure that you would come to love it Pam! I love how the scribble stitching looks like hand drawing lines. And it really works so well for your robots appliques! I am thinking of turning my daughter's drawings to the applique, and I think this technique will be perfect! I am sure I will not have problem making wonky stitches! So cute and so fun!! Thanks for the inspiration! Thanks so much for sharing this! I love this kind of applique . I did some by hand and love it. Now seeing your tuto I really love to try it out by machine too. So thanks for your inspration! Pam I love this scribbly stitching! I usually use a zig zag too, but I think this is really run. Especially with the wonky effect going with the robots. Which I love by the way! I am excited to see the quilt completed. Have fun.